Well designed expertly crafted signs that last and last. For over thirty years our family and staff have been creating well designed, expertly made signs of all kinds, using materials that are appropriate for each individual sign project. Driven by one constant that comes above all other imperatives. To make you, our customer, look Great! Signblasters.com..... a family business that promises the personal touch! 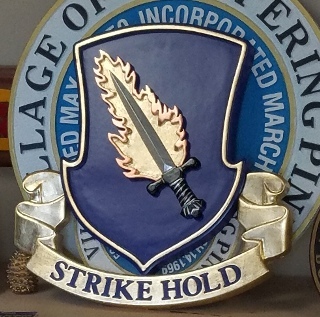 We create three dimensional signs, sandblasted, routed and carved, where the background is removed to create raised or carved letters and graphics, just like many other sign companies. This gives you a more interesting sign with two levels which creates shadows and makes it much more interesting than a flat two dimensional sign. What is different about us is that we also create three dimensional signs not with just two levels but many multiple levels. 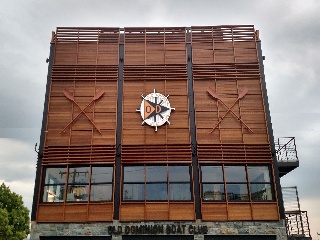 The Old Dominion Boat Club routed sign has 7 levels. Click on any photo here to see the large version and look at how much more interesting they are. 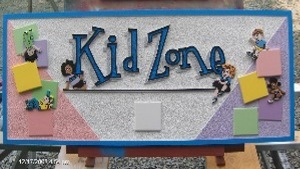 The kids Zone is not a large sign but it still has 6 levels. It is our job to create a sign that is different enough that people see and more importantly notice and remember it. 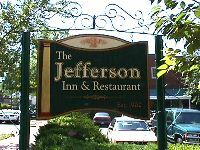 We specialize in unusual and "outside the box" signs (see some of our Unusual Projects). We reinvent the wheel every day; if you have an idea, run it by us, I'm sure we can help. And if you want a regular dimensional sign we can definitely help with that as well. Many subconscious assumptions are made in the first few seconds when your sign is viewed for the first time. And whether it's right or wrong, people do judge books by their covers. Consider how many signs you actually read when you are driving? If you were to read every sign as you drove down the road you would never get over 10MPH and yet somehow you have a knowledge of most of them. It is our job to grab the attention of the viewers subconscious and convince it that whatever your perception and image of your home, business or organization is; we portray it in such a way that the viewer is left in no doubt that this is the place they want. The choice of a sign font can be important. Each of these signs projects a different image, think about the feeling you get when you look at each sign. Other very important visual clues are taken from materials, shapes and colors. There are over 55,000 fonts in the English language. About 95% of them are useless for signage, that leaves a few thousand; many of those do not come with a full character set. But even when you get down to that many, some words look great in one font but other words in the same letter style can look awful. Trust your professional sign designer to help you to choose the right font for your sign. How far away the sign will be viewed from. At what speed is the viewer travelling. Are the letters 3 dimensional, sandblasted, carved, routed ? Extra shadows can enhance some signs while making others harder to read. This is also affected by the depth of the letters. There are dozens of other things to be taken into account when designing a sign and in thirty years we have found that not every "designer" is very well trained in sign design. Just because it looks good on a printed piece of paper when held under your nose and it has your undivided attention will it be even the tiniest bit noticeable at 60 mph. then add in other distractions and many signs become invisible. So how come you do know what many of those signs say? It's your subconscious. Our job is to make your subconscious go "ooh, what was that?" If we do that then its a good sign. However, we strive to make your subconscious go "WOW! hey conscious mind - get a look at that!" If we do that then we have a great sign! And that's what we try to do every day. If you know the Type of sign you want (and by that we mean the material and/or the method of manufacture), go to the "Type of sign" on the main menu above. There you will see a list of choices. When you "mouse over" an item it may expand giving you sub categories etc. That will lead you to what you are looking for. If that doesn't work try typing your type of sign into our search box, and if you still haven't found what you want, call us on 1 800 948 4307. Several types of signs are known by different names in differing parts of the country. We probably have what you are searching for, but just by another name.